It has been too long between pictures around here! 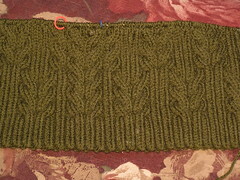 This is one full pattern repeat of the Wall Street Vest for Boar. It has become clear to me that there is NO way this will be done in time for Christmas. That’s okay though, I have plenty of other things with his name on them. D#1 called with terrible news yesterday. A student was killed during a fight at an off campus party. You can read about it here.She was not at the party nor did she know the student personally. Alfred is a very small school though, with quite a ‘family’ feel to it and this is shocking and terribly upsetting. I feel badly for all the families involved. I will be so glad to have D#1 home this weekend. Gorgeous knitting!! The pattern is splendid. The vest is gorgeous, those cables are really outstanding. I’m sorry that tragedy has come even this close to your daughter. I bet you’ll both feel better once she’s home. Oh Ann, a parents worse nightmare. What a tragedy. ws looks good but that is so horrible about the death.